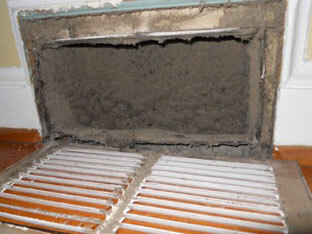 Most people are now aware that indoor air pollution is an issue of growing concern and increased visibility. 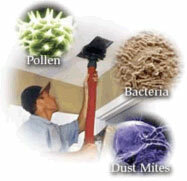 Many companies are marketing products and services intended to improve the quality of your indoor air. If not properly installed, maintained, and operated, these components may become contaminated with particles of dust, pollen or other debris. If moisture is present, the potential for microbiological growth (e.g., mold) is increased and spores from such growth may be released into the home's living space. Some of these contaminants may cause allergic reactions or other symptoms in people if they are exposed to them. Failure to clean a component of a contaminated system can result in re-contamination of the entire system, thus negating any potential benefits. Methods of duct cleaning vary, although standards have been established by industry associations concerned with air duct cleaning. 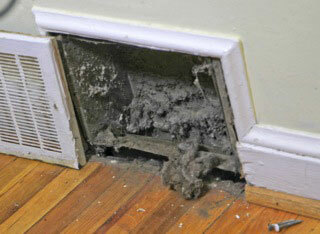 Typically, a service provider will use specialized tools to dislodge dirt and other debris in ducts, then vacuum them out with a high-powered vacuum cleaner. The Environmental Protection Agency (EPA) themselves declare that indoor air is anywhere from 2 to 10 times more hazardous than outdoor air. The EPA also warns us that the indoor air quality is the United States' number one environmental health problem. Today's homes and buildings are built air-tight, and contain a long list of pollution sources. As a result, natural air-cleansing agents such as ozone and negative ions are kept out, while contaminants are kept in. A recent study found that the allergen level in super-insulated homes is 200% higher than it is in ordinary homes. According to Scientific America, a baby crawling on the floor inhales the equivalent of 4 cigarettes a day, as a result of the out-gassing of carpets, molds, mildews, fungi, dust mites, etc. Most people spend well over 90% of their time indoors. In which case, indoor air is going to impact our health far more than outdoor air. The EPA informs us that 6 out of 10 homes and buildings are "sick," meaning they are hazardous to your health to occupy as a result of airborne pollutants. Asthma cases have increased by more than 100% since 1976. About 1 in 9 children now have asthma. Death rates due to asthma have tripled, and quintupled in children ages 5 to 9, since 1976. Hospitalization rates and doctor visits are still continuing to increase dramatically. Today's homes and buildings are built air-tight, and contain a long list of pollution sources. As a result, nature's air-cleansing agents such as ozone and negative ions are kept out, while contaminants are kept in. According to Scientific America, a baby crawling on the floor inhales the equivalent of 4 cigarettes a day, as a result of the out gassing of carpets, molds, mildews, fungi, dust mites, etc. The EPA informs us that 6 out of 10 homes and buildings are "sick", meaning they are hazardous to your health to occupy as a result of airborne pollutants. Our professional duct cleaners provide the best air duct cleaning services to residential homes and commercial businesses throughout Maryland and Washington DC.